Poland is one of the undiscovered jewels of Europe. Concert venues are excellent with enthusiastic full audiences. The cost of eating out is very competitive, and the culture and scenery second to none. This tour is designed to take in the most interesting locations in the area. 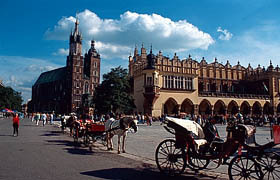 We have, to date arranged over 30 tours to Krakow. The best days for concerts are Friday, Saturday and Sunday â€“ so the suggestion is that you fly out of the UK on a Thursday. All optional tours are the most competitive available â€“ and some 30% cheaper than other operators â€“ PLUS all venue hire, concert/piano hire and publicity is included in the tour price. Day 1 Coach pick up from designated points for transfer to Airport for direct flight to Krakow. On arrival, you will be met by your Melody Music representatives [English and Polish Speaking] who will transport you to your very centrally located Hotel â€“ The Ibis]. All accommodation is on a bed and breakfast basis and all rooms are en suite. The hotel benefits from a very central location being on a few minutesâ€™ walk from the old town square. The airport is some 30 mins away from the hotel [depending on traffic. Day 2 Free day to explore the City or optional tour to Auschwitz. During the visit, the Choir can perform a brief song in remembrance of the souls lost. This is a very moving experience and a memorable part of past tours. Post event, transfer back to hotel. Day 3 Free day to explore the city. Krakow is one of the most interesting towns in Central Europe. In the evening we hold the first main concert which will take place in the Church of St. Peter and Paul located near main square â€“ and excellent venue which holds many people and is one of the most famous landmarks in Poland. The concert will take place at 7pm after the main Mass [The Choir will also be required to perform 2 items during the Mass if possible]. After the performance, the group can enjoy time at the main square before returning to their hotel via coach. Day 4 In the morning we offer an optional tour to visit the 700-year-old Wieliczka Salt Mine. An unforgettable three miles of underground chambers, caves, chapels and statues all sculptured from salt. If the Salt-mine option is taken the choir to give a brief performance in the underground Cathedral of the mine â€“ made entirely out of Salt! â€“ with excellent acoustics. Afternoon at leisure in preparation for the last concert â€“ the magnificent Mariatski Church on the town square. Day 5 After breakfast, we have our coach transfers to the Airport for return flight to UK where coaches will be waiting to transport us back to base. This price is guaranteed with deposit of £50 per person.